Nassau, Bahamas – Water doesn’t just keep us alive, it’s in everything we do, everywhere we go and is something we use everyday. Water & Sanitation Month is a designated period dedicated to recognising the importance of proper sanitation practices in our daily lives. 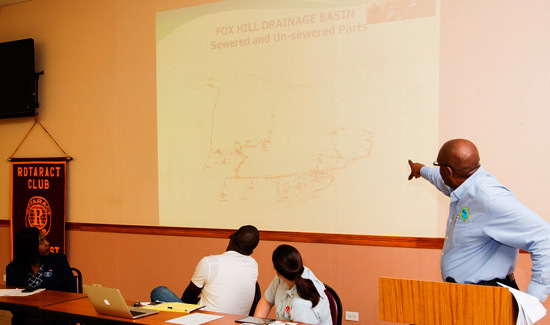 To help celebrate Water & Sanitation Month, the Rotaract Club of South East Nassau Centennial, invited the Water and Sewerage Corporation (WSC) to speak at their weekly meeting. As the Corporation recently completed their Wastewater Master Plan, the topic was very timely and the perfect time for WSC Senior Manager, Bradley Flowers, to discuss the new plan and give a general update on WSC’s current projects and successes. In 2009, the Corporation developed a Water and Sanitation Sector Strategic Plan, which was revised in 2013 with grant financing from the Inter-American Development Bank (IDB). The new Wastewater Master Plan, which was completed in 2015, included assessment of the existing sewerage network/facilities for New Providence, the rehabilitation/expansion of major treatment plants, the rehabilitation of gravity collection systems and force mains, and the refurbishment of sewer lift stations. 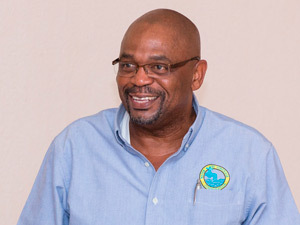 During his presentation Flowers noted that wastewater management is taken for granted, as some people may not even know where their wastewater goes. He also noted that FOG (fat, oil and grease) is the main problem for some of their wastewater treatment plans. With the new wastewater master plan, WSC is trying to address this issue and others in their management and treatment of wastewater. In addition to speaking about the Wastewater Master Plan, Flowers’ advised Rotaractors about the various changes that the Corporation has been undertaking to provide better customer service and most importantly improved water services. Since receiving the IDB loan, WSC has reduced water losses by over 1 billion gallons within the last two years, a savings of $6.5 million. Replaced nearly 14,000 service lines, repaired over 650 water mains, cleaned nearly 1,500 system valves, and created designs for addressing critical sewerage infrastructure needs. They have also worked to improve their customer experience by adding email bill notification, online payment, and now the ability for customers to see their accounts and payments online. Flowers also noted that the corporation is utilising social media to improve their communications with the public, and encouraged the Rotaract Club of East Nassau Centennial to like their Facebook, twitter or instagram pages to keep up with the improvements works and notifications. Pictured is Bradley Flowers during his presentation.